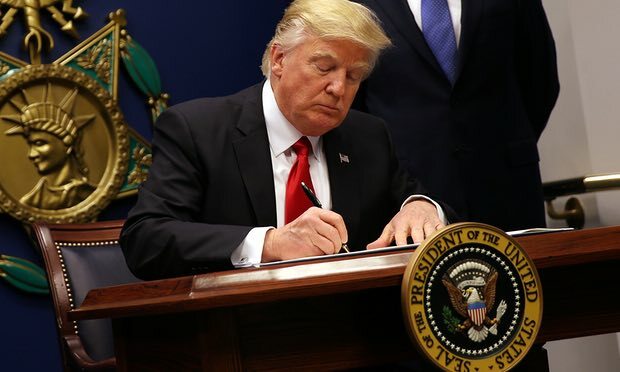 On 28 January, President Trump issued an Executive Order to impose tighter vetting on travellers entering the US from countries considered high risk for extremism and terrorism. The new president said the world is in trouble; but 'we're going to straighten it out,Ok, that's what I do; I fix things". Reacting to the threats posed by Islamic extremists he said the world needs American leadership to confront the challenges posed the Islamic state. "These are bad people. They are sneaky rats and they blow people up in a shopping centre, and they blow people up in a church. They are bad people. When you're fighting Germany and they had their uniforms, flags on the plane, and the whole thing. We are fighting sneaky rats right now that are sick and demented. And we're going to win"- President Trump contrasting the battle against ISIS with the conventional warfare seen in the second world war. (The Guardian). In support of the administrations determination to deal with ideology of radical Islamic terrorism, his Deputy National Security Adviser, KT Macfarland stressed that "without American leadership, global jihadism will usher in its version of paradise-the destruction of the apostates and unbelievers and the triumph of the caliphate"
"We are now at the beginning stages of a global war against Islamic fascism"- Steve Bannon; President Trumps Chief Political Strategist and National Security Council Member.